Fuel efficiency testing has to be the most unglamorous aspect about being a motoring journalist. I would even term it as tedious ? keep your average speed in check, watch those revs and ensure the throttle inputs aren't too heavy or light just so that the test has high degree of repeatability. And, of course, there's frustrating traffic to deal with, always. But, today I am engrossed; it's almost like I am playing a game on the PSP. You see, this car I am driving has an energy meter with graphics of an engine, an electric motor, a driveline and a battery on the car's central display. And I am told if the driveline remains green and only the electric motor comes alive, I score, and score high. However, if the engine with its red glow lights up, I desperately need to up my game. So the plan for the day is to keep the engine out of the equation for as long as possible by using the throttle judiciously and the brakes and off throttle cruising to the maximum. I am driving the Toyota Camry Hybrid, which at close to Rs 40 lakh on road (Mumbai) is not a gaming console, but a tool to help save both money and the environment. It costs 20, which it replaces in the Indian line up by the way. And besides a greener drivetrain, the Hybrid also gets more comfort features. But more on that a little later; first, the hybrid tech. Hybrid is a technology that uses both an internal combustion engine and an electric motor powered by a battery pack to power a car. 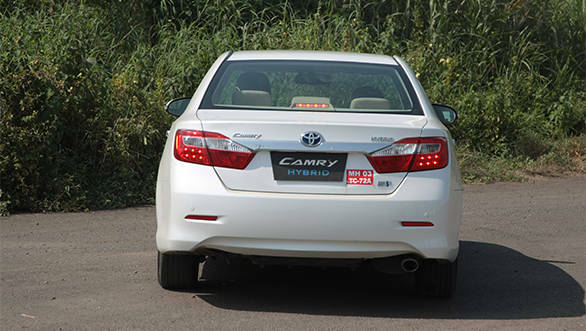 Hybrids are of various types, but the Camry is a series-parallel hybrid, which means the car can run either on electric power alone, or singularly on petrol power, or on a combination of both. 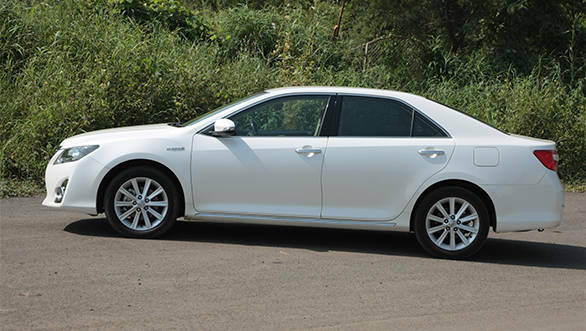 In case of the Hybrid Synergy Drive used on the Camry, the electric motor mostly kicks in at start up and if the throttle is pressed into service lightly, it will keep running on electric power alone up to about 50kmph or till the battery charge runs out, which on most occasions is about five minutes. At higher cruising speeds, the onus of powering the car lies solely with the engine. However, if you are heavy footed, both the engine and the electric motor chip in for what is respectable performance for a car that weighs over 1.6 tonne. 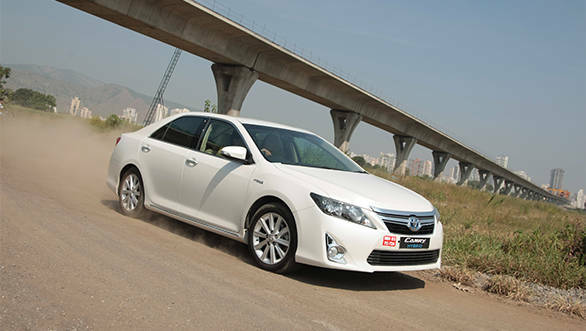 The Camry Hybrid takes 9.1 seconds to 100kmph and 16.7 seconds for the quarter mile run. The 40-100kmph run though is completed fairly quickly; it takes only 6.6 seconds. 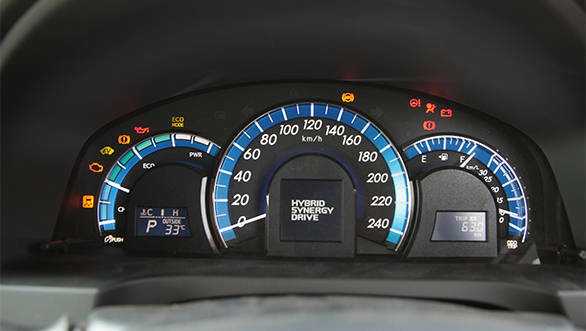 The top speed for the Hybrid meanwhile, is a claimed 188kmph. The figures apart, the Camry also feels quick on its feet. The initial throttle response is electric thanks to 270Nm of torque available from the word go. After the engine kicks in though, there's a drop in the rate of acceleration and the throttle response isn't as deft either. But we still won't call the progress slow by any stretch. The Camry Hybrid uses a CVT, which is mated to both the engine and the electric motor. Its operation is mostly unobtrusive and very unlike a typical CVT. However, give it the stick and the high rpm engine drone does get a bit bothersome. But, at least the engine is refined and not very loud. The 2494cc, four-cylinder petrol engine is the same as the one used on the regular Camry. It makes 160PS of max power, which is 20PS less on the regular petrol. But add the electric motor to the equation, which in itself is rated at over 140PS, and the total rated output for the Camry Hybrid stands at 205PS. I know the sum of outputs of the engine and the motor total up to a much higher figure, but because the engine and the motor never really go all guns blazing at the same time, the net output figure is lower. 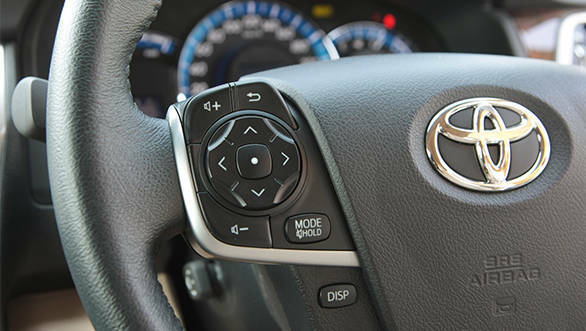 The Camry Hybrid also comes with three driving modes: EV for a fully electric drive, Eco tries to keep the car running on the electric mode for as long as possible, and there's the normal mode wherein the Hybrid works more like a normal petrol car with start-stop tech. If you want to enjoy driving, the normal mode works best. The throttle response is more instantaneous and the engine and the battery work together almost all the time to return a crisper driving experience. The EV mode, meanwhile, never came on. Every time we tried switching to it, the car reminded us that there just wasn't enough charge in the battery. The Eco mode is the one to use for everyday driving. The throttle response is lazier, but then to make the best of this mode one has to be really gentle with the throttle any way. One must also drive with an eye on the energy meter all the time to ensure the driveline stays green more often than red. And the speeds should never cross 50kmph to give the Camry a fair chance to run on electricity for as long as possible, and with it achieve fuel economy that only diesel hatchbacks can manage! And, that's exactly what I managed after hours of 'computer' gaming at the wheel of the Hybrid. The car returned nearly 20kmpl even though I only averaged 25kmph in the city! In our regular city run though, the Camry averaged 13.4kmpl with the figure climbing to a not too impressive 15.8kmpl on the highway. The reason for such little difference in the fuel economies achieved in the city and highway is the way the Camry Hybrid functions. The electric motor almost never comes on on the highway. Only when you push the throttle deeper does the electric motor come alive to assist the engine but the car never runs on electricity alone unlike in the city. In terms of driving feel, the Hybrid is a bit different from the regular Camry. To begin with, it is extremely quiet. All you can hear inside the cabin is the tyre noise. The steering is light and reasonably quick which works well in the city. The ride again is well judged for city commute. The Hybrid rides the small bumps and pot holes, patchy tarmac and undulations with hardly any jiggle or noise, and it only gets caught out by deeper, square-edged road irregularities. The visibility is good too and this nearly five-metre car rarely feels its size in the city even when parking, thanks to the good view out of its ORVMs and its reversing camera. The Camry Hybrid is a large luxury car, and it feels that way on the highway. It has comfortable seats and great straight line stability. But, take it up a winding road and the Hybrid has very little to keep the keen driver interested. It doesn't like to be pushed hard, it rolls and it doesn't shrink around the driver which makes it a bit challenging on a tight, twisting road. The vague and cold steering doesn't help either and then you have the brakes that have a strange, artificial feel to them courtesy regenerative braking. Moreover, the initial bite is poor and the car feels heavy under braking. As far as looks go the Hybrid isn't dramatically different from the regular Camry. But look closely and you will find a different bumper, logos with a blue hue and the hybrid badging on its front fenders and boot lid. It also gets LED lamps ? an energy saving measure ? and larger 17-inch wheels running low rolling resistant tyres. 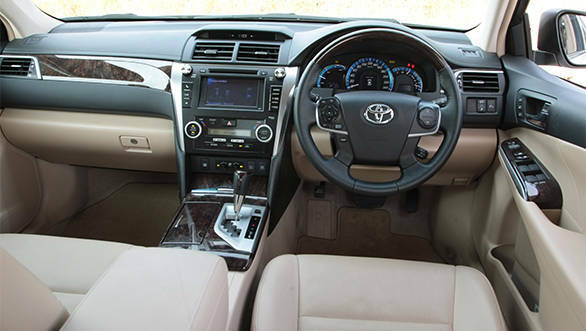 Inside the Hybrid looks almost identical to the normal Camry as well, but it sports more equipment, especially for the rear passengers. 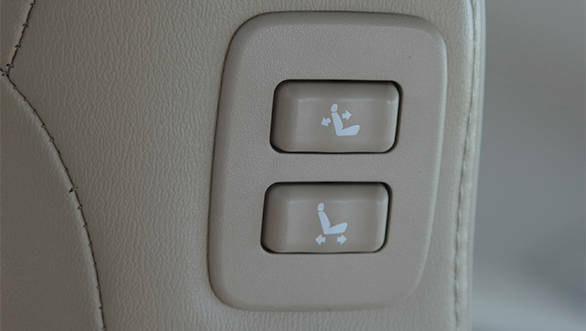 The rear seats recline, there are audio controls in the central armrest along with temperature adjustment. 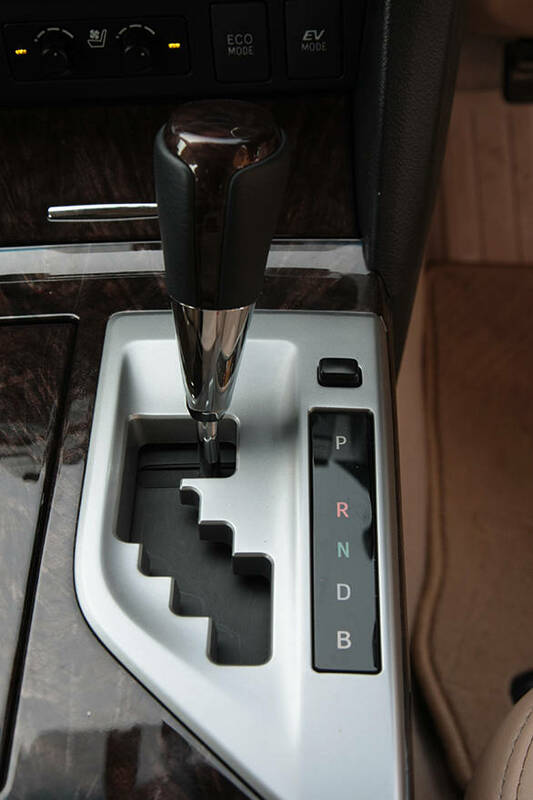 The Hybrid in fact comes with a three zone climate control system ? two upfront and a different temperature zone for the rear passengers. Upfront, the driver and the co-passenger also get cooled seats. The seats themselves are 8-way adjustable and the driver also gets two memory settings. Automatic headlamps and wipers and electric adjust for the tilt and telescopic multifunctional steering is standard on the Hybrid too. On the safety front, there's vehicle stability programme besides ABS and front and side airbags for the front two occupants. But for some reason, the Camry Hybrid doesn't come with the curtain airbags its competition offers. 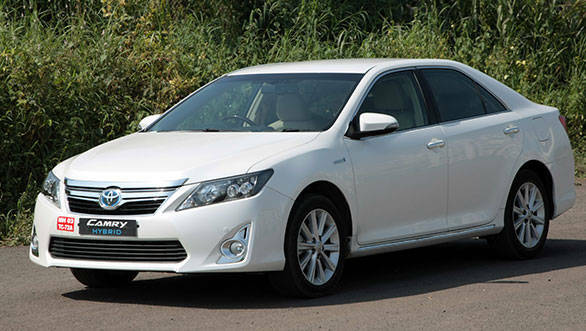 But even with the curtain airbags missing, we think the Camry Hybrid is a good car to have. In fact, any car that can have the driver hooked to fuel economy without it being thrust upon him is definitely worth a look in. Moreover, the Camry Hybrid is one of the better equipped cars in its class when it comes to luxury features. And it isn't short on space or practicality either. As we see it then, if it's a petrol car you want in this class, apart from a luxury badge, the Hybrid ticks almost every box.